This article appeared as an introduction to a Comparison Chart on Treatment Planning Systems in the July/August 2013 issue. This is a brief overview of the newest software systems available on the treatment planning systems market. Treatment planning systems are at the heart of radiation therapy (RT) systems and the key to improved patient outcomes. Once image datasets are loaded and the tumors are identified, the systems develop a complex plan for each beam line route for how the therapy system will deliver radiation. The software also computes the expected dose distribution in the patient’s tissue, including variables such as tissue energy level penetration influences by the type of tissue the beam lines encounter (e.g., bone or lung vs. muscle). These systems also help navigate beam placement based on avoiding critical structures that are more sensitive to radiation in an effort to reduce collateral damage from the therapy. This may include automated, complex programming for multi-leaf collimator (MLC) leaf sequencing to shape the beam around critical structures during dose delivery. These treatment plans can also be modified to compensate for the reduction in tumor size over the course of treatments. See the latest news and articles on treatment planning on the ITN Treatment Planning Channel page. 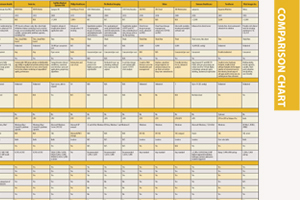 Access the most current version of the ITN Treatment Planning Systems Comparison Chart (www.itnonline.com/content/treatment-planning-systems). This will require a login, but it is free and only takes a minute to complete the form. XiO is a comprehensive 3-D intensity modulated radiation therapy (IMRT) treatment planning platform that combines advanced planning tools with robust dose calculation algorithms. It supports a range of treatment modalities, including 2-D, 3-D, MLC-based IMRT, solid compensator-based IMRT and brachytherapy. In addition, dynamic conformal arc therapy and stereotactic delivery are supported. XiO offers advanced dose calculation algorithms, including Clarkson, FFT Convolution, MultiGrid Superposition, Fast Superposition and Electron Monte Carlo. Clinicians can choose the algorithm that is most appropriate for each plan. The software helps simplify planning with user-definable templates, calculation grids and workspace. Elekta’s Monaco system offers treatment planning for IMRT, volumetric modulated arc therapy (VMAT) and stereotactic body radiation therapy (SBRT). Monaco features innovative biological cost functions with multi-criteria constrained optimization, a leaf sequence optimizer and a robust Monte Carlo dose calculation algorithm. Pinnacle³ is designed for small and mid-size centers as an affordable server-class system that provides access from virtually any location. The system is also scalable so it can grow with a center’s needs. It can support centers with up to three linear accelerators (LINACs). Centralized processing offers all users the power of the professional server. The system is up to 30 percent faster than the older 810X platform. Floating licenses allow a Pinnacle³ user to have unlimited number of access points, including MacIntosh users. The Panther 3D Conformal Therapy system is designed to improve efficiency. It operates on the user-friendly Windows platform, allowing the fast generation of treatment plans due to the familiar Windows look and feel and the vendor’s intuitive user interface. The system is completely modular to make upgrades with new modules easy and seamless. Panther supports Siemens virtual wedges, and photon and electron beams can be combined. It offers MLC support, and the MLC display can be turned on or off. MLC can auto fit to any selected organ with a specified margin, including inner, outer or center edges. Individual MLC leafs also can be graphically edited. Previously an OEM for treatment planning systems offered by other vendors, RayStation has created its own RaySearch proprietary system. It incorporates optimization application tools that have been in operation for nearly 10 years. The core of the system is the ORBIT software framework, which is currently used by some 2,000 clinics all over the world for optimization of IMRT, VMAT and 3-D conformal radiotherapy (3-DCRT). RayStation has been designed for 4-D adaptive radiation therapy as a built-in generic feature and it incorporates the latest techniques for proton therapy. It also contains tools for multi-criteria optimization, enabling a much more intuitive treatment planning process. The software uses a modular design to offer different combinations of capabilities. RayStation’s proton features are pending regulatory approvals and have not been cleared for marketing outside of the European Union. The Eclipse system allows for efficiency. Virtual simulation eliminates data transfer steps and the management of separate sets of data. Emergency treatments can be planned immediately in the simulation area. Powerful tools simplify contouring tasks and field setup, and a fast calculation engine reduces treatment planning time. Integrated plan verification and quality assurance tools speed ongoing treatment planning and beam data validation, saving time for physicists. For example, with the portal dosimetry option, the physics time required for IMRT pretreatment verification is reduced to less than 20 minutes per patient compared to hours with film. High-resolution IMRT treatments can typically be delivered in a normal 15-minute time slot on a Varian Clinac linear accelerator.